Fairfax Senior Housing is a 54 unit affordable senior housing development nestled in the trees just off Sir Francis Drake Boulevard in Fairfax, CA. The future building is sited between two hills and follows the terraces of the site’s topography with a two-story portion of the building nearest Sir Francis Drake Boulevard. The central three story portion of the building wraps around two court yards and includes the main entry lobby, management and service offices, common laundry facilities, and resident common spaces for resident gatherings and events. Both courtyards are protected with deer fencing as they provide landscaped resident use areas. One courtyard provides raised accessible planter beds for resident’s use and the other courtyard provides an outdoor area off the community room for outdoor resident events. The new building will be approximately 50,000 sq.ft. with 43 parking spaces. 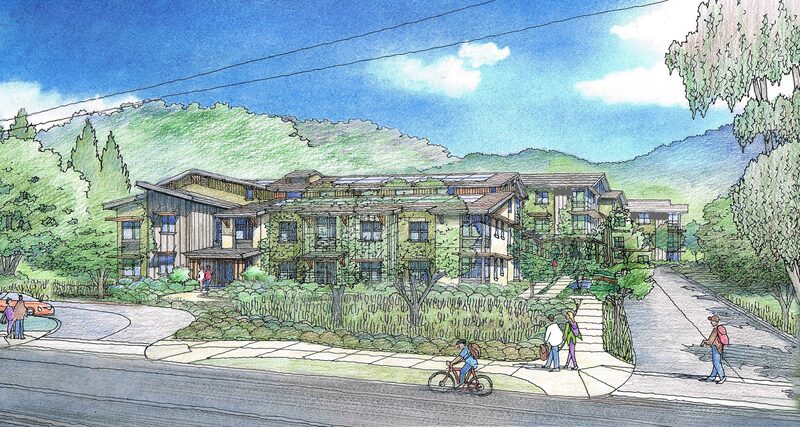 The Fairfax Senior Housing Project proposes to develop a lively, affordable housing community, and hopes to encourage a connection with the surrounding outdoor environment while providing easy access to the surrounding communities via nearby transit.